(TibetanReview.net, Aug05, 2014) –China has further tightened control on the freedom and livelihood conditions of Tibetans in Driru (Chinese: Biru) County of Nagchu (Naqu) Prefecture, Tibet Autonomous Region (TAR), by issuing in Jun 2014 a booklet detailing two sets of draconian regulations. The Dharamshala-based Tibetan Centre for Human Rights and Democracy, which issued a report on the new regulations on Jul 30, said they target the local Tibetans’ “freedom of movement, speech and religion”. The regulations warn that violators will be subjected to “strike hard” measures, citing a host of stringent Chinese national and TAR regional criminal law provisions, the centre added. The regulations, of which the centre said it had received an incomplete set of scanned copies, outline severe punishments for anyone violating the regulations, including dismissal from one’s monastery, cancellation of welfare entitlements, being banned from joining other local Tibetans in the annual caterpillar fungus harvesting season for three to five years, and being otherwise subjected to six months of legal education detention. Those who cross the national border illegally and fail to return face immediate cancellation of their household registration while their families face the other punishments mentioned above. The regulations say they are aimed at maintaining social stability by cracking down on separatism and support for the “Dalai clique” and prohibit Tibetans from participating in religious gatherings, including overseas. 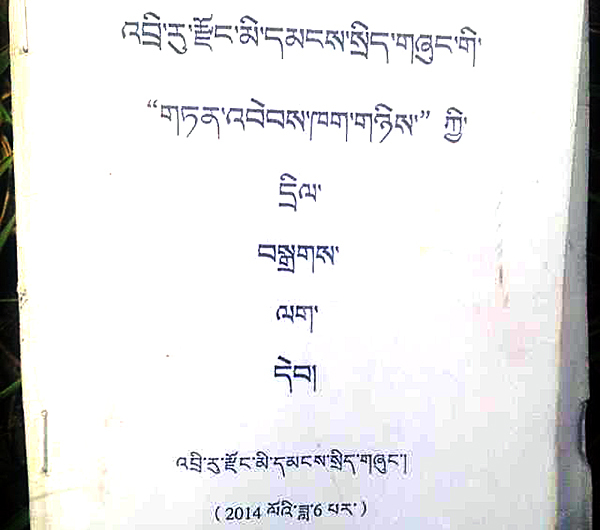 The regulations’ subtitle is cited as saying they are temporary measures targeting illegal activities such as participating in the ‘Great Prayer Festivals’ by crossing the national boundaries – an apparent reference to the Jul 2014 kalachakra empowerment teachings in India by the Dalai Lama – creating and spreading rumours, propagating harmful information, travelling to areas outside one’s locality to pursue religious study. The regulations hold those violating the religious ban provisions guilty of colluding with what they call the 14th Dalai separatist clique. Serving as well as retired Tibetan officials of the Chinese government also face punishment if implicated in any violation of the regulations, including by their family members or relatives. Other long list of banned criminal activities include holding Tibetan nationalist views; advocating separatism; producing, distributing, importing or possessing inflammatory propaganda materials; spreading rumours; propagating videos or songs in praise of the 14th Dalai Lama and his separatist group; online propagation of harmful speeches and other activities of the 14th Dalai and his separatist group; any fabricated speech that contravenes truth or any harmful information that condemns China’s policies in Tibet; and poems and songs that promote Tibetan independence, differences between nationalities, praising the 14th Dalai and his clique. Those implicated in the violation of the banned, allegedly criminal activities, but not tried or convicted face six months of detention under legal education. The crimes are defined in the broadest possible terms to enable the authorities to implicate virtually anyone they like for their violations. Even failing to hoist the Chinese national flag attracts punishments, with their severity depending on whether there were one or two failures in a year. China has been cracking down severely in Driru country ever since Tibetan there protested against an order to fly its flag from the rooftops of their homes and monasteries nearly two years ago. There have also been protests against environmentally and sacrilegiously destructive Chinese mining projects. There have been killings in violent crackdowns, closing down of monasteries, and large scale arrests and disappearances of Tibetans in an ever worsening series of crackdowns.